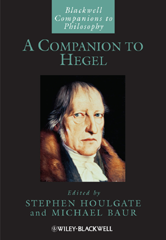 This companion provides original, scholarly, and cutting-edge essays that cover the whole range of Hegel's mature thought and his lasting influence. A comprehensive guide to one of the most important modern philosophers. Essays are written in an accessible manner and draw on the most up-to-date Hegel research. Contributions are drawn from across the world and from a wide variety of philosophical approaches and traditions. Examines Hegel's influence on a range of thinkers, from Kierkegaard and Marx to Heidegger, Adorno and Derrida.